Hydergine’s musical roots and influences are going back to the classic sound of the 90s dub techno pioneers. His pseudonym is taken from the name of a smart drug used to improve the metabolism of brain cells and cognitive abilities. With its dark and atmospheric soundscapes, the a-side track “Grid” follows that root in a perfectly manner and shows his love for tape and tube sounds. On the flip side the title track “Static Frame” offers sparkling synth lines and shuffling hi hats. The modulated echoes go straight from your ear to your brain. The reduced drums and driven synths in “Sweep” will finally beam you into a basement techno party full of fog and strobe lights. 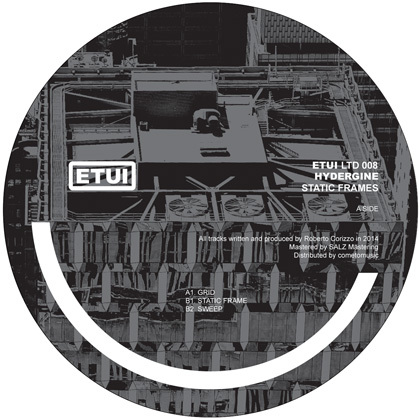 After releases on his own Ranges imprint, Separate Skills Recordings or Tiefenrausch we finally welcome the italian producer on Etui Records. Signal Deluxe: Dub!!!!! the love of our lives!! can’t go wrong here! thanks a lot for this. Luciano Esse: I love this EP!! All tracks are amazing!! Static Frame is my fav! Gel Abril: great dubby tracks! Regen: Great one from Roberto. Static Frame is my favorite.